Drawing from over 50 years engineering and maintenance service experience, JLA has brought to the forefront the most advanced technology in total Marine Loading & Unloading System Solutions. 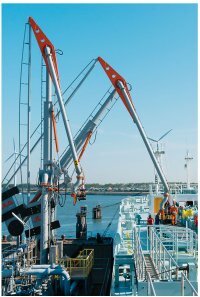 With unique reliability features; such as cable free design, in situ service long life swivels, & worldwide servicing provision, JLA Marine Loading Arms and complementing equipment are tested for 15 years continual daily operation and warranted for 10 years. Additionally, with their own live dock testing facility, high flow optimized JLA arms offer the fastest loading times and lowest overall operational costs available today.